The Theme It app has 4 tabs: Home, Themes, Options and Account. Once you install Theme It, you can sign up for an account with Theme It and navigate all the themes in the repository using its clean interface. The homepage section has features and random themes for you to explore. You can browse themes and filter them by newest, paid, and free themes. Sort results by name, date, author or rating. For any individual theme you can view all the details including screenshots, and see its star rating and find out if it supports iPhone 4 retina display. Tap the compatible button to find out what devices the theme supports including iPhone, iPod, iPad, iOS 4.2, 4.1, and 4.0. Here you can check out the version history and get support links for the theme as well. Managing your device themes is also done within Theme It. If you’ve already purchased a theme you can upgrade it to a newer version, or delete it. Other options include clearing your image cache, getting email notifications for new themes, and changing the app’s own default interface. You can browse the available themes from the web by going to http://themeitapp.com/themes/ as well. In other News, Cydia is has also launched its very own Theme Center today. Use iPhone mods and hacks at your own risk! Installing 3rd Party iPhone apps requires you to jailbreak the iPhone before installing the native software and apps. Browse the full list of all iPhone and iPod touch jailbreak apps filed under the software category. 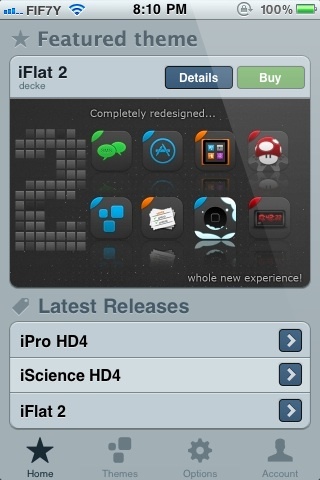 AppSafari review of Theme It was written by Joe Seifi on January 24th, 2011 and categorized under Cydia Apps, Featured. Page viewed 8116 times, 1 so far today. Need help on using these apps? Please read the Help Page.